After the loss of a tooth, bone tissue around the socket begins to deteriorate, which means that the body breaks it down since it no longer needs to support the tooth. Gum tissue can be lost due to tooth loss, advanced periodontal disease and other dental conditions. Our Los Angeles, Beverly Hills tissue regeneration expert offers treatments that can stimulate new tissue growth and ensure better dental health. Several techniques are available, including the use of bioactive gels and bioabsorbable membranes. Our expert in tissue regeneration in Beverly Hills, Los Angeles uses a variety of minimally invasive techniques that can be used to regenerate bone, periodontal ligaments, connective tissues and other tissues. These procedures can be used together with other procedures to treat and control periodontal disease or as part of a full mouth reconstruction. A deep cleaning may be needed to remove plaque and tartar and reduce the bacterial load. Some patients may need additional therapy with antimicrobials to get the infection under control and reduce the risk of complications. Several materials are available to stimulate the tissue regeneration. Our Beverly Hills tissue regeneration expert can use your own tissues, donor tissues or synthetic tissues to regenerate new tissue growth. Autografts, or your own tissues, are considered the standard. There is no risk of an immune reaction, and the architecture of the tissues is perfectly matched. Allografts use donor tissue. These tissues come from other people and go through several processes to reduce the risk of complications, including disease transmission and immune reactions. Synthetic products are also available. Each type of graft material offers specific benefits, and our expert in tissue regeneration in Beverly Hills will work closely to ensure that you have the most appropriate treatments for your needs. Your treatment may include additional treatments, including dental implants, to help preserve tissues once they have been adequately stimulated. If you have lost teeth or have suffered from advanced periodontitis, we can help. The right treatments can stabilize your oral health and increase the odds of recovery. 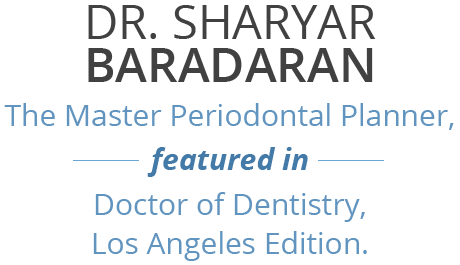 Give us a call today to find out more or to schedule your consultation with our periodontist in Beverly Hills.